According to Bhagavada Purana, Agnidhara1, Idhmajihva2, Yajnabahu3, Mahavira4, Hiranyareta5, Medhatithi6, Ghrtaprstha7, Savana8, and Vitihotra9, Kavi10 are names of the seven (out of ten sons) who inherited the continents from Priyavrta. The three sons, Mahavira4, Savana8, and Kavi10 were avowed inveterate Bramacharins (celibate seekers of Bramah Vidya and god). (Priyavrata married Barhjismati, daughter of Visvakarma, the architect of the gods who gave him ten sons and a daughter Urjasvati.) Priyavrata had, by another spouse, three sons: Uttama, Tamasa, and Raivata who were in charge of three Manvantras, named after them. According to Vishnu Purana, Priyavrata and Kamya, the daughter of Kardama, had two daughters, Samrat and Kukshi, and ten sons, Agnidhara, Idhmajihva, Yajnabahu, Hiranyareta, Ghrtaprstha, Medhatithi, and Vitihotra, who inherited the globe and three other celibate sons. CREATION AND DISSOLUTION for the story on Kardama. Mahavira, Savana, and Kavi were not interested in material wealth and devoted themselves to the Lord. 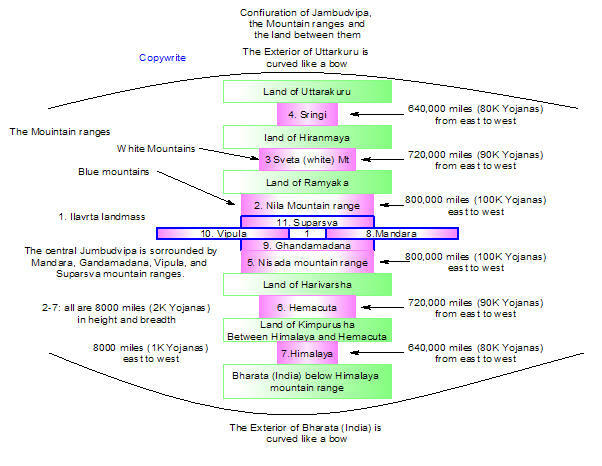 Priyavrata, having ruled the globe for 1.1 billion years (1,100,000,000), divided the earth into seven parts by the rut left by the chariot wheels, which resulted in seven continents and seven seas. Thus, the earth is divided into seven Dvipas (Continents, primary divisions) ruled by seven sons of the monarch. Dvipa = Dvi + ap = two + water = land within the two distributaries = Island. 1 Yojana = 8 miles. The globe (Jumbudvipa) has the round configuration of seven concentric circles of a lotus flower with a diameter of 100,000 Yojanas (800,000 miles). Each Dvipa (continent) consist of nine Varsas (countries, Subdivisions). Varsha = Country; division of the earth by nine mountain ranges; rain; year.) Each Varsa is 72,000 miles in extent. In the epicenter of the surface of the globe is present the inner Varsa, Ilavrta, which again in its center has the principal mountain range, the king of Mountains, Meru, the Axis Mundi. Meru = Sumeru = Very exalted, the mountain of the gods. It appears that Sumeru and Sumeria are cognate. Sumeru reaches into the firmament by a height of 672,000 miles. Consider Himalayas (Mount Everest) reaching a height of only 5.5 miles (29,035 feet). The moon is at the distance of 238,906 miles from earth. The flat top of the Mount Meru is 2.81 times the distance of the moon from earth. Mount Meru is made of pure gold. It forms the circular pericarp of the lotus-like globe, in which the base (lower end) of the pericarp lies 16,000 yojanas (128,000 miles) below the earth; the base measures also 16,000 Yojanas in diameter. The corolla of the mountain measures 32,000 Yojanas (256,000 miles). On the top of the Mount Meru is the City of Brahma. The Dvipa, inhabited by human beings, by analogy, is the innermost swirl of seven-layered whorl of petals of the Lotus, round at the circumference of the corolla, 800,000 miles across. This Dvipa is divided into nine Varsas or countries, each one extending 72,000 miles and the nine Varsas are separated by eight mountain ranges. Pericarp = corolla = Petals considered collectively. Here is the Mount Meru (the inverted cone), the Axis Mundi of the earth, according Bhagavata Purana and Vishnu purana. Jambudvipa consists of Central Asia and India. Mount Meru is the Pamirs, a mountainous region in central Asia, largely in Tajikistan, where the Hindu Kush, Tien Shan, and Himalaya mountain ranges converge: highest peaks, ab. 25,000 ft. The configuration of the world (heavens, netherworld or the universe) according to Puranas. The flower's center is the Mount Meru. In the above diagram, the configurations are round; for ease of drawing they are rendered as squares. As you notice, 5. Kraunca continent is shown while the Dughda sea is not shown. India is placed in the southern part of Jumbu Continent. Meru Mountain, the Axis Mundi, is in the epicenter of the most central Island continent, Jambudvipa. Jambu-dvipa = Rose Apple Tree Continent. Each continent is surrounded by a sea as listed above and below. These continents and seas are laid out in a circular pattern, though one of the diagrams shows squares for convenience in drawing. The diagram of circles represents only five continents and their respective seas. The layout is not according to scale in the square diagram as described in Puranas. The central continent, Jambu is surrounded by salt water sea, which is surrounded by Plaska continent with its surrounding sea of sugar-cane juice and so on and so forth. Just imagine a fountain with a central column (Meru Mountain) on a platform surrounded by water and the circular wall around the water; the water and the wall configuration repeats until the outermost ocean of sweet water surrounds all entities. On the summit of Mount Meru, Brahma built a city spanning 14,000 leagues (1 league = 3 miles). Outside the perimeter, Indra and other deities built their cities. The City of Brahma is right in the middle of Ganges River, which originates on the foot (toe) of Vishnu and falls on the Mount Meru. 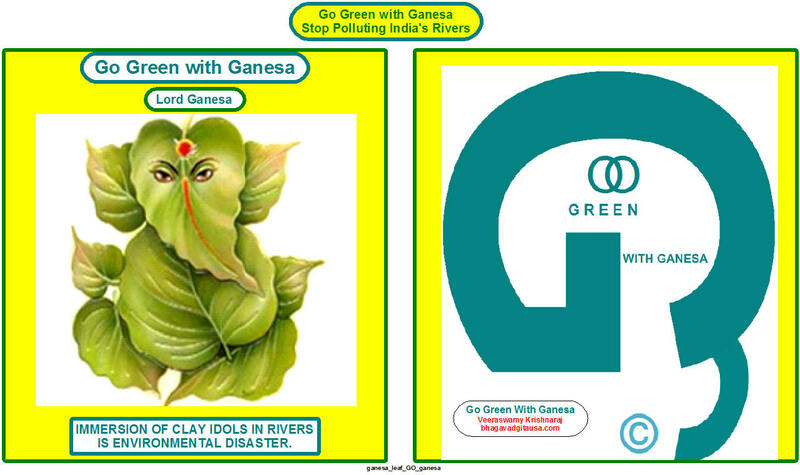 Ganges divides into four rivers (Sita, Alakananda, Chaksu, and Bhadra) going in all four cardinal directions. Sita goes to the east side of Meru on to Badrasva country, emptying in the ocean; Alakananda goes south to Bharat Varsha (India), becomes seven distributaries and ends in the ocean; Chakshu goes west down the mountains and Ketumala Varsha and reaches the sea; Bhadra winds its way to the northern country of Uttarakuru and merges with the sea. Another version states that Ganga fell on the matted locks of Siva first before it hit the earth, so that the brunt of the fall was borne by Siva. Away from the central City of Brahma, there are other cities of Lokapālas (world protectors, Regents of directions, Guardian Deities): Indra, Yama, Varuna, Kuvera, Vivasvat, Soma, Agni, and Vayu. Vayu established cities on the linear filaments of the mountains for gods. Himavat is where Siva performs penance and marries Uma. Kartikeya, son of Siva, was born in the Sara forest and spears the mountain into two parts. Ilavrta of Jumbudvipa is the centerpiece with the Meru Mountain and extends 54,000 miles to the north and 54,000 miles to the south of the center. Salt water sea (Lavana) 800,000 miles wide Sea of Sugar-cane juice (Ikshu),1.6million miles wide Sea of wine (Sura), 3.2 mil. miles Sea of Ghee (Sarpi) 6.4 mil. miles Ocean of milk (Dughda), 12.8 mil. miles Ocean of curds (Dadhi), 25.6 mil. miles wide sea of sweet water (Jala), 51.2 mil. miles wide. As you notice the land and the respective sea have the same dimensions with progressive centrifugal doubling of their dimensions. Padma Purana says Meru Mountain has the configuration of Datura flower and a bell. Vayu Purana says Meru Mountain has colors on its sides: white on the east, black on the west, red on the north and yellow on the south. Some say there are angles to Meru. According to Bhaguri, it is a quadrangular column; Savarni says it is octangular; Atri sees a hundred angles; Bhrgu and Varshayani agree it has a thousand angles. Galava sees a saucer; Garga sees a column looking like a braided hair; others say it is simply circular. Linga Purana has its own version: east has the color of Ruby; west, golden; north, coral; south, lotus. The Buddhists of Sri Lanka say it is a circular column of uniform diameter; those of Nepal compare it to a drum. To the north of the epicentral Ilavarta are three mountain ranges, Nila, Sveta, and Sringavan, which extend east and west to the salt ocean and form the boundaries to the Varsas: Ramyaka, Hiranmaya, and UttaraKuru. They are 16,000 miles wide but each distal one is shorter in length by 1600 miles than the proximal mountain range; their height and width are the same. The most central landmass is Ilavrta which has the inverted cone of Meru Mountain. The mountain ranges recede in height as they slope down from the center of Jumbudvipa. Immediately adjoining the Mount Meru are the buttressing mountain ranges: Mandara to the east, Ghandamadana to the south, Vipula to the west, and Suparsava to the north. Extending to the north and south are six mountain ranges and six landmasses. The Central Mount Meru with its neighboring mountains. Each mountain (top) has a tree growing on the top: Ficus Indica on the northern Suparsva, Kadamba tree on the eastern Mandara, Jambu tree on the southern Gandhamadana and Pipal tree on the western Vipula mountain. The continent was named after the Jambu tree. Jambu fruit is of the size of an elephant and upon impact on the crest of the mountain breaks and its juice flows into Jambu River. The inhabitants drink the juice and thereby live a good life without exuding any foul odors in their sweat. The dry juice on the banks of the river becomes gold (Jambu Nada) fabricated into ornaments by the Siddhas. Source: Vishnu Purana. Bhagavata Purana has some variations in the kind of trees at the top and the name of the mountains. Bhagavata Purana trees: Mandara has Mango tree; Merumandara, Jambu tree; Suparsva--Kadamba tree ; Kumuda--Banyan tree (Ficus benghalensis--East Indian Fig tree). Jambu, Kadamba, and Banyan stand like flags on poles on the top of the mountains; each one measures 8,800 miles tall and 800 miles in diameter at the trunk, and branches extend to a diameter of 8,800 miles. Milk, honey, sugar-cane juice, and fresh water fill four lakes respectively, thus quenching the thirst of Yaksas, Kinnaras and the like and conferring on them mystical powers. Four celestial gardens, Nandana, Chaitraratha, Vaibhrajaka and Sarvatobhadra, are the playgrounds of gods with the celestial beauties, featuring singing by the demigods. Mango trees on Mount Mandara bear mountain-size fruits, which upon falling, break into rivers carrying fragrant sweet scarlet juice quenching the thirst of the inhabitants and the land of eastern part of Ilavrta. Because the Yaksa women drink this heavenly mango juice, they smell heavenly and the breeze sweeps over their bodies as they stroll with the goddess Parvati and takes the fragrance to a distance of 80 miles from around them. The Merumandara rose-apples break open and the juice runs like rivers in the southern area of Ilavrta. The clay on the banks of the river soaked with Rose-apple juice transmutes into gold (Jambunada) under the action of the sun and the wind. The immortal inhabitants like Gandharvas wear jewels made of this gold. Suparsva Kadamba tree pours forth rivers of honey irrigating the western parts of Ilavrta. The celestial ladies drinking this celestial honey develop sweet breath which pervades to a distance of 800 miles all around them. Mount Kumuda's Banyan tree issues forth streams which go to the northern areas of Ilavrta, satisfying all desires and wishes and thus bringing cereals, milk, honey, butter, other victuals and amenities such as beds, ornaments, clothes. According to Vishnu Purana, Priyavrata married Kamya who gave him two daughters, Samrat and Kukshi and ten sons, Agnidhara, Agnibhau, Vapushmat, Dyutimat, Medhatithi, Bhavya, Savala, Putra, and Jyotishmat. Note that one name is missing here. Nine brothers married the nine daughters of the deity of Mount Meru: Merudevi, Pratirupa, ugradamstri, Lata, Ramya, Syama, Nari, Bhadra, and Devaviti. 1. Nabhi ruled Hima, south of Himavat, the snow-mountains. He married Meru Devi who gave him Risabha, who had a son by name Bharata, after whom India was named as land of Bharata, which is actually the proper name for India. Bharata was one of the 100 sons of Risabha. Bharata inherited the kingdom, and Risabha retired to the hermitage of Pulastya and performed austerities. He became very emaciated, put a pebble in his mouth and went on a Great Road (death). Pebble in the mouth indicates Maunam (silence) and or forced fasting. Bharata-->Sumati-->Indradyumna-->Paramesthin-->Pratihara-->Pratihartta-->Bhava-->Udgitha-->Prastara-->prithu-->nakta-->Gaya-->Nara-->Virat-->Dhimat-->Mahanta-->manasyu-->Twashtri-->Viraja-->Raja. 4. Ilavrta ruled the epicenter of the Jambudvipa having Mount Meru. 5. Ramya ruled the land between the epicenter and Nila mountain. 7. Kuru ruled over Hiranmaya. These countries had no dualities like virtue and vice; Spontaneous and continuous enjoyment with no ups and downs was the order of the day. Earth, part of Jumbudvipa, has Himavan (Himalaya), Hemakuta, and Nishada, south of Meru Mountain, and Nila, Sveta and Sringi to the north of Meru. Proximate buttressing mountains are Mandara is on the east, Ghandamadana on the south, Vipula on the west, and Suparsva on the North of Meru. Mount Meru has at its base ridges that look like filamentous roots of the lotus. 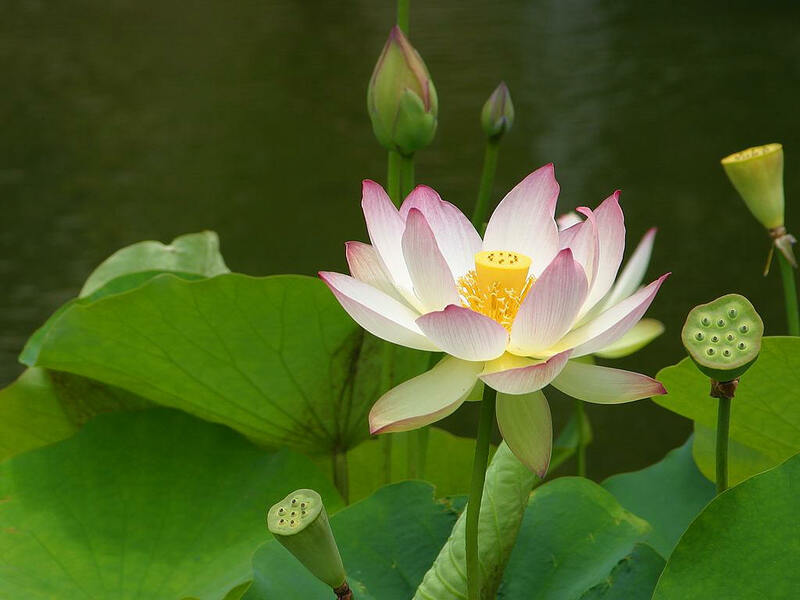 The Dvipa, inhabited by human beings, by analogy, is the innermost swirl of seven-layered petals of the Lotus, round at the circumference of the corolla, 800,000 miles across. This Dvipa is divided into nine Varsas or countries, each one extending 72,000 miles and the nine Varsas are separated by eight mountain ranges.